Submitted by Norm Roulet on Tue, 07/25/2006 - 00:55. THIS IS A FIRST TIME EVENT: See Cleveland in a whole new way: WITHOUT YOUR CAR! because MLK Dr will be closed to cars... TWO SUNDAYS IN AUGUST! 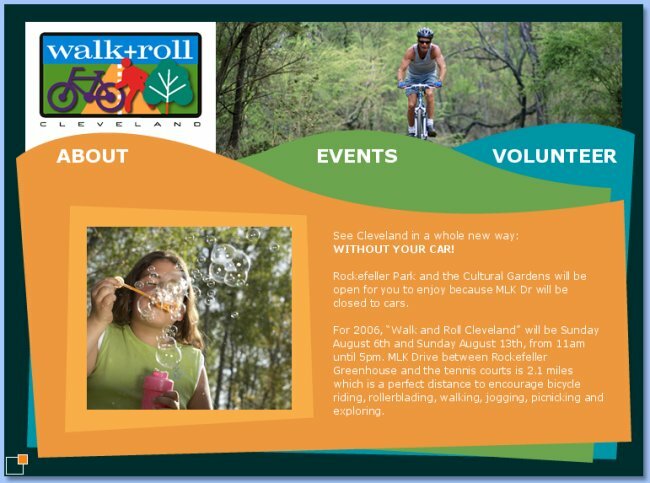 New for 2006, “Walk and Roll Cleveland” will be Sunday August 6th and Sunday August 13th, from 11am until 5pm. MLK Drive between Rockefeller Greenhouse and the tennis courts is 2.1 miles which is a perfect distance to encourage bicycle riding, rollerblading, walking, jogging, picnicking and exploring. 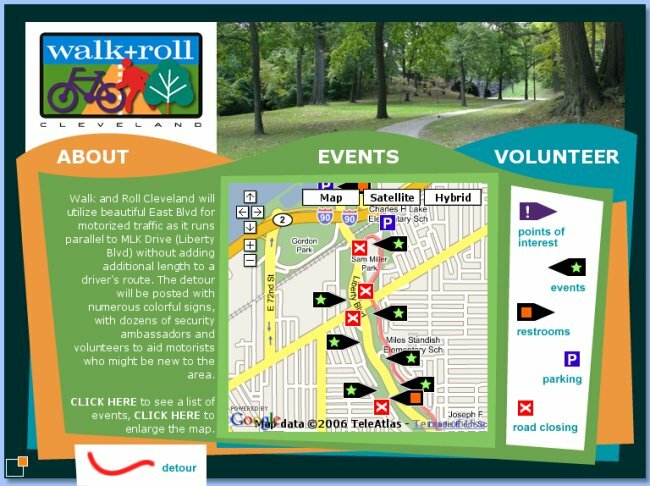 Walk and Roll Cleveland will utilize beautiful East Blvd for motorized traffic as it runs parallel to MLK Drive (Liberty Blvd) without adding additional length to a driver’s route. The detour will be posted with numerous colorful signs, with dozens of security ambassadors and volunteers to aid motorists who might be new to the area. Click Here to see a list of events, click here to see map. They are also looking for voluneteers, so visit here to help out! Submitted by lmcshane on Tue, 11/28/2017 - 11:09. Walk+Roll Cleveland was officially the first Ciclovia / Open Streets event in the United States. I had vaguely heard of similar events in Bogata, Columbia from Ryan McKenzie who was another Cleveland visionary. There were a few other US cities who closed some streets occasionally but Walk+Roll Cleveland was the first to add activities and community events during the street closing. Cleveland was at least a year ahead of NYC's Summer Streets program, 2 years ahead of Portland's Sunday Parkways program, 3 years ahead of San Francisco's Sunday Streets program, etc. We did Walk+Roll Cleveland in 4 neighborhoods plus also in Lakewood which was wildly successful but wasn't given funding by the powers-that-be. After 5 years of trying to get funders and bigwigs in NE Ohio to support the program, I gave up and moved to Portland. I'm really, really thrilled to see Ciclevia: Open Streets Cleveland, OneWorldDay - Cleveland, Bike Cleveland, NEOCycle Cleveland Velodrome Slow Roll Cleveland Discussion, VeloSano Cleveland Critical Mass and other bicycling things happening in NE Ohio! Next Trip To The Inner Circle, Visit "Inner Circle"